With Paul Holleran on holiday in Ireland, Leamington will be led into their final friendly of the summer tomorrow by Martyn Naylor and Morton Titterton. 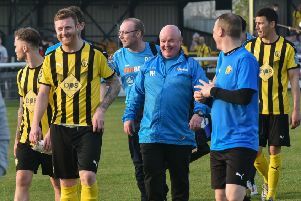 Former assistant manager Titterton has been helping out in training in Holleran’s absence and the Brakes boss admits the ex-Stratford manager is someone he often uses as a sounding board. “Morton is someone I speak to a lot,” said Holleran. “And he will be helping out on Saturday. “So it will be attack, attack, attack,” he joked. A Worcester City side including former Leamiington favourite Richard Batchelor and prolific forward Lee Hughes are the visitors to the Phillips 66 Community Stadium with Holleran again placing little emphasis on the result. “We’ve had more training and less matches this pre-season and we’ve come through unscathed. n Leamington’s Southern Premier Division trip to Biggleswade Town has been brought forward a day from Saturday April 15 to Good Friday, with kick-off at 3pm.